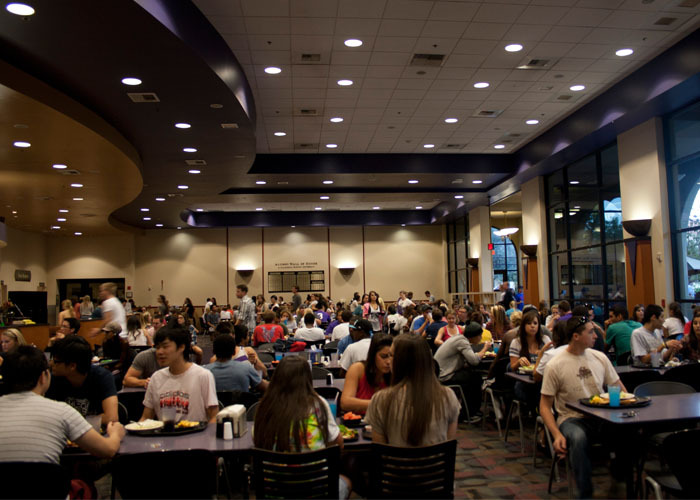 Jacob Armstrong – The Alumni Dining Commons provides a lot more excitement during meal times because of more than a 600-student increase in enrollment this fall. The student enrollment has risen for 12 consecutive years. From full tables in the Alumni Dining Commons to video feeds of chapel services in the Wallace Book of Life Theater, evidence of California Baptist’s highest student enrollment can be seen across the campus. This fall, 6,031 joined the ranks of CBU Lancers marking the 12th straight year of increased enrollment in the university’s history. The enrollment total surpassed the 2010-2011 total of 5,413 by over 600 students — an 11. 4 percent increase. Figures include undergraduate, graduate and Online and Professional Studies students. “This has been an exceptional period of growth during a difficult time in the country and particularly in the Inland Empire,” Ellis said. Schmidt said the “campus is very different from my freshman year,” in terms of parking, student housing and campus events.